Our Iron Hero and Wonderful Heroine appeared at The Autism Awareness Walk in Conroe! We were happy to partner with The Fairytale Headquarters on this event. ​The Hero Characters were out in full force at the Modaero NextGen Aviation Festival in Conroe to entertain the children at the event! 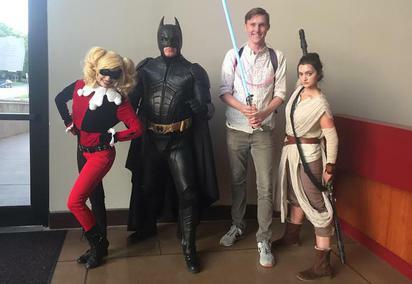 ​Our Dark Side and Light Side Warriors visited The Melting Pot to celebrate the opening of Star Wars: The Force Awakens. Our Characters greeted guests during a delicious fondue experience. The Superheroes were out in full force for free comic book day! They visited all five Bedrock City Comic Company locations. The Superheroes visited with guests at the Pearl Fincher Museum of Fine Arts. The Superheroes partnered with the ladies from The Fairytale Headquarters to visit with guests of the Library. The Superheroes visited with the participants of The Faces of Innovation: Global Teen Summit at the John P. McGovern Museum of Health and Medical Science. The Superheroes visited with children at all five Bedrock City locations during the summer. The children were entertained with Storytimes, Crafts, Games, and Superhero Training. The Superheroes loved meeting the kids at Wonderwild in The Woodlands for their Superheroes and Princesses Event. The Superheroes entertained the guests at the Skeeters game at Constellation Stadium in Sugarland. The Superheroes came out to celebrate Batman Day! The Superheroes visited with guests of The Microsoft Store in The Galleria for the Extra Life event that benefitted The Texas Children's Hospital. Our Bat Hero and Wonderful Heroine visited with guests at The Melting Pot on Westheimer.